Howdy from Dallas! On another adventure for the ole’ 9-5 and spending lots of time in airports, which got me to thinking about something. Baggage! Nowadays when you fly, nearly every airline charges for checking baggage (and some even charge for using the overhead bins!) I’ve always been a light packer, and I can’t stand waiting for the baggage carousel to come around, so when I go on these short business trips, I don’t check baggage. But it is inescapable — you cannot travel without something on your shoulder. And so is the metaphor in all of this. 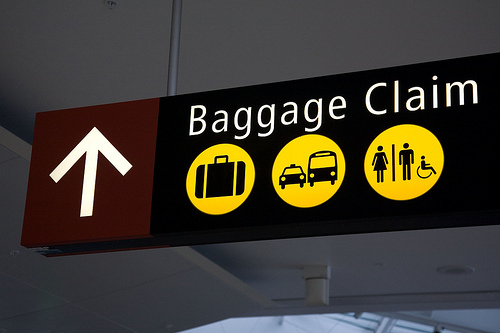 We all have our baggage, and it’s not that easy to check it at the gate. So here comes the question — how much baggage can one carry around and expect to move forward in one’s life without the weight of said baggage holding him/her back? When is it time to let go of some baggage? The answer is different for everyone and every situation. In relationships, it is really hard to not arrive with a couple of extra bags; we’ve all been scorned in the past and though we don’t want to take that out on our new partner, there are things that we can not let go of. I was with my ex for 4 years, so when we broke up and I quickly was involved in another relationship, it wasn’t completely cut and run. In my eyes, the relationship was over, but there was some smoothing over and other issues that got knotted together that took a while to clear up. My ex and I spoke frequently for the first year or two into my new relationship because of these issues. I was lucky enough to have a partner who understood my baggage and knew it did not threaten our relationship. I will always be grateful for that. But your baggage can destroy you and your chances for moving on. It can change your perspective, screw with your priorities, play games with your heart. It’s not just about closure — it’s about acceptance, learning from situations and letting go. Letting go can be so freakin’ hard and no one can force you to let go. It’s one of those experiences you have to go through alone. So the next time you are about to embark on a new adventure, be sure your baggage isn’t weighing you down. And now for the music companion for this post.